If you've been waiting for the newest and shiniest Samsung tech to get a bit of Magenta branding, wait no longer: the Galaxy Note 3 is now available from T-Mobile.com. The Galaxy Gear should be on sale, but at the time of writing the online store pages for the watch are returning errors. 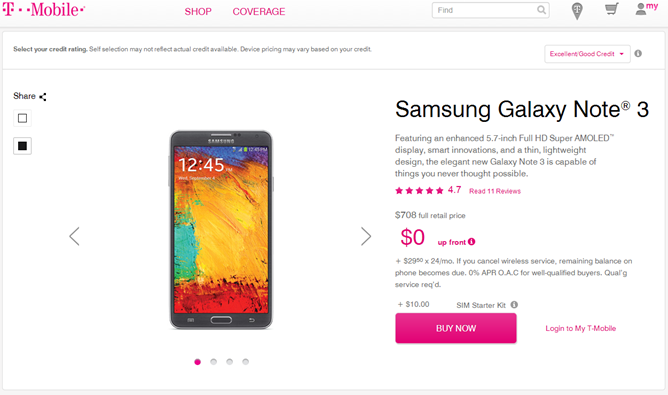 T-Mobile retail stores should be offering both devices starting today. The Galaxy Note 3 is $708 at full price, $199 plus a $21 monthly charge over 24 months, or $29.50 per month with zero down (if you qualify). The Galaxy Gear is $299.99 and is sold separately. At the moment the only real competition for the Galaxy Note on T-Mobile is LG's G2, thanks to the shared Snapdragon 800 processor. The Note 3 has an advantage in both RAM (3GB) and storage (32GB on the base model), not to mention a larger 5.7" display. Of course they're both 1080p panels, so it really comes down to personal preference for size, unless you just have to have the S-Pen and Samsung's customized software. Both devices use a 13MP rear camera, but LG has the technical edge with optical image stabilization. The G2 also has a significant price advantage at $600. The Galaxy Note 3 is available in black and white models. The Galaxy Gear is being offered through all of Samsung's various carrier partners, but it's unlikely to be discounted any time soon, so there's not much point in shopping around. 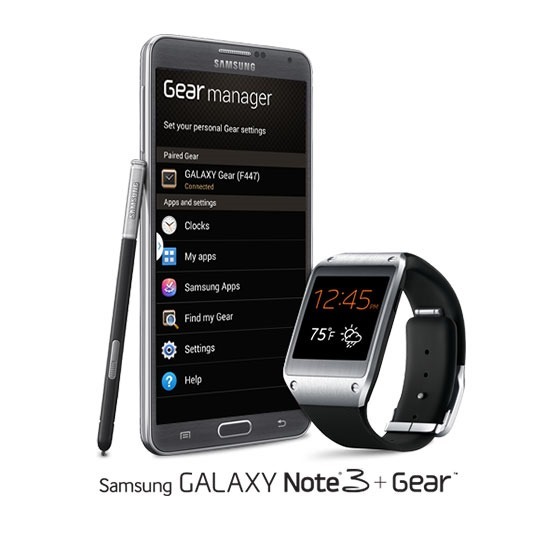 The Gear smartwatch currently works only with the Galaxy Note 3 and Note 10.1 2014 Edition, though Samsung will probably expand to other devices within its own lineup eventually.